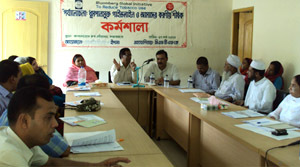 YPSA has developed draft smoke free guideline with the collaboration of Smoke free coalitions for Feni, Comilla and Cox’s Bazar Municipality with the aim to protect the non smoking people of Chittagong andBangladesh working in or visiting enclosed and partially enclosed workplaces and public places from exposure to secondhand tobacco smoke (passive smoking). The policy seeks to assist individuals and organizations (both businesses, religious and civil society) within the municipalities to understand their responsibilities under smoke free legislation and to ensure that Municipalities regulatory authorities take a consistent, fair and proportionate approach to enforcement. The guideline also ensures the maximum smoke free places so that smokers have least chances to smoke. 3 Small working groups of 3 areas were closely involved with the process of smoke free guideline development. For reviewing the draft guideline YPSA has organized 3 workshops on “Review of Smoke Free guideline” in Feni, Comilla and Cox’s Bazar Municipalities where all coalition members were attended. In Cox’s Bazar, Mr. Md. Humayun Kabir Khandakar, Addisional District Commissioner (Education and Development), Mr, Sarwar Kamal, Mayor, Cox’s Bazar Municipality and Ms. Helenaz Tahera, Panel Mayor, Cox’s Bazar Municipality were presented. In Feni, Mr. Alim Akhter Khan, Additional District Magistrate, Feni, Mr. Abu Taher, President, Feni press club were presented and In Comilla, Mr. Md. Arif, Chief Executive Officer of Comilla Municipality, Mr. Jamir Uddin Khan Jampi, Councilor, Comilla Municipality and Mr. Alamgir Khan, President, Business Committee were attended. 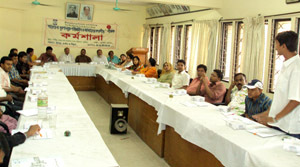 Darpan and PIDS have cooperated to organize the workshop in Comilla and FHDF has cooperated in Feni.